I recently received a jar of Tropical Traditions Coconut Oil to try, and I’d like to share a review of their product with you today. I’ve been using coconut oil in my cooking for over a year now and absolutely love it! I’ve also used it as skin moisturizer and lip balm. Sometimes, I even eat it straight off the spoon! There are a couple of other brands of coconut oil that I’ve used in the past that I thought were okay. I was really curious to see what the difference in this particular brand would be. One thing I noticed right away, was that the consistency was creamier than the other brands. I of course had to do a straight from the spoon taste test (Hey, I do these obligatory experiments strictly for you guys, honest!). 😉 I found that it had a nice “toasted” coconut flavor. The coconut flavor was also more subtle than others I’ve tried, so for those of you that don’t enjoy that flavor, this might be a good option for you. My husband liked that it didn’t have any aftertaste either. Fun Fact: Coconut oil is solid at room temp (below 76°F) and liquid when heated. You can watch the video they produced about Gold Label Virgin Coconut Oil. Pros: I like that it’s made in small batches from family producers. The Tropical Traditions coconut oil has by far the best texture and flavor of all the ones I’ve tried. Cons: It costs more, but that’s to be expected with a higher quality product. I know some people that go in together and order the big 5 gallon bucket and then split it between each other. I can’t buy it locally, but that’s not a total deal breaker. *Closed * Now, for the giveaway! 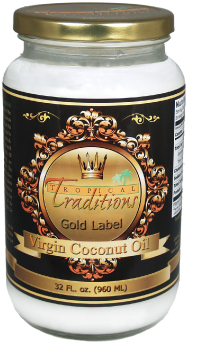 The nice people at Tropical Traditions have offered to give away a one (1) quart jar of their Gold Label Virgin Coconut Oil to one lucky reader! You must enter through the Rafflecopter widget below. Registering for the Tropical Traditions email sales letter is mandatory. You may also earn extra entries through other options listed on the widget. One winner will be randomly drawn and be notified by email. I was so excited to come across your blog. Am looking forward to all the wonderful healthy information you provide. Have been recently researching health benefits of coconut oil and specifically the anti-inflamatory properties. Looking forward to trying this product. Thanks again for the healthy tips and information. I am a coconut fanatic!! I would LOVE to try this brand!! Thanks for this opportunity!!!!!!!! we LOVE using coconut oil for lots of things…not just food….I made a face scrub using a mixture of coconut oil, baking soda, and peppermint essential oil…wonderful!